For the Mutant Force member, see Randall Darby. Interior artwork of The Amazing Spider-Man #579 (December 2008). Shocker (Herman Schultz) is a fictional supervillain appearing in American comic books published by Marvel Comics. Herman Schultz is a career criminal who, after several prison terms for robbery, built a battle suit that sent out shock waves to quickly open safes as well as give him a significant advantage over the police. His criminal career as the self-styled "Shocker" put him in direct conflict with the superhero Spider-Man, belonging to his rogues gallery. The character has been featured in various media adaptations, such as feature films, television series and video games. Portrayed by actor Bokeem Woodbine, the character made his cinematic debut in Spider-Man: Homecoming, set in the Marvel Cinematic Universe. The character first appeared in The Amazing Spider-Man #46 (March 1967) and was created by writer Stan Lee and artist John Romita Sr. He appeared as a regular character in Thunderbolts from issue #157 to 162, when he deserted the team. He was also one of the main characters in "The Superior Foes of Spider-man" comic series. Cover of The Amazing Spider-Man #46 (March 1967), Shocker's introduction. Art by John Romita, Sr.
Herman Schultz was born in New York City. He was a high school dropout who had brilliant talents as both an inventor and an engineer. Instead of using such talents to gain legitimate employment, he became a successful burglar and the world's best safe-cracker (according to him in later stories). After finally being caught and incarcerated for his crimes, he developed a pair of gauntlets designed to shoot air blasts, vibrating at high frequency. Schultz uses his gauntlets to escape from prison and becomes the supervillain known as "The Shocker". He defeats Spider-Man in their first confrontation (since Spider-Man was at a disadvantage due to having a bad left arm sprain from an earlier battle with the Lizard) during a robbery. While robbing a bank, he was later beaten and sent back to prison after Spider-Man pinned Schultz's thumbs away from the gauntlets' triggers with the webbing and then knocked him out. Shocker later stole an ancient stone tablet with an inscription for a formula that could restore youth, that had been earlier stolen by the Kingpin. Likely Schultz's most ambitious solo exploit was his attempt to hold New York City for ransom by blacking out various electrical grids to spell out his name, and extort one million dollars from the city. He then made one million dollars by harassing a stock broker. Shocker later joined Egghead's Masters of Evil (with Radioactive Man, Tiger Shark, Moonstone, and the Beetle) to incriminate Dr. Henry Pym, then on trial for treason. The Masters battled the Avengers in this encounter; Shocker was brainwashed and purposely abandoned by Egghead to deliver a false testimony, and subsequently cooperated with the authorities in exonerating the ex-Avenger. Shocker was later hired by the Nazi war criminal Baron Von Lundt to kill Dominic Fortune, and built the vibro-shock units into his entire uniform to do so. Shocker was hired by the Chameleon and Hammerhead to induce Electro to join their organization. Shocker later attempted to steal thousands of charity dollars at the celebrity fund raiser for the New York City Library. He's captured by Spider-Man and sent to prison. He later escapes with the help of fellow inmate Boomerang. By this time, he's developed severe confidence issues and has become terrified that the Scourge of the Underworld is going to kill him. A tipping point occurs when Spider-Man apprehends him and seems to not take him seriously. Enraged, Shocker defeats Spider-Man and is about to finish him off when a Scourge imposter intervenes, causing Shocker to flee. When he next appeared his confidence issues are gone. He aims to hunt down Scourge himself and kill him first. Shocker has proven to be a constant presence among Spider-Man's gallery of enemies. He often works as a member of a team (including Hobgoblin's Sinister Seven, Norman Osborn's Sinister Twelve, Doctor Octopus's most recent Sinister Six, and the Masters of Evil) or in partnership with at least one other villain. Previous alliances include Boomerang, the Beetle, Rhino, Leila Davis, Hydro-Man, and Speed Demon (all of which made up the Sinister Syndicate), and the Trapster, Constrictor and Jack O'Lantern. He also teamed up with a large group of villains during the Acts of Vengeance, when he helped them unsuccessfully attack the Fantastic Four. During one of his team-ups with Doctor Octopus, he participated in a raid on Avengers Mansion, hoping to help conquer it as the heroes were distracted by the events of the Infinity War. Shocker was forced to fight alongside the heroes called the Guardians of the Galaxy when alien doubles of both sides attacked. After the doubles stopped coming, Doctor Octopus tried to order Shocker and the others to continue fighting the heroes but instead, they turned on Doctor Octopus. They did not wish to harm the people who had helped save their lives. Shocker helped chase Doctor Octopus out of the building. At one point in his career, Shocker became increasingly paranoid that he was on the Scourge of the Underworld's hit list, even though there was no actual proof that he was. He thus started seeking ways to become more powerful, hoping to thwart any attempt on his life by the vigilante group. [volume & issue needed] Shocker somehow acquired actual superhuman vibration powers. As he becomes more powerful, he realizes that the new powers will eventually kill him. He seeks a vibrational harness to cure himself and is aided by Night Thrasher and Spider-Man. Shocker has had Spider-Man on the ropes on several occasions, with timely interventions often saving Spider-Man. Individuals thwarting Shocker's victories over Spider-Man include security guards, Dominic Fortune, and even a Scourge of the Underworld impostor. Shocker has also let Spider-Man go on a few occasions, the first being when he found Spider-Man incapacitated with a bout of vertigo on the outside of a tall building. He doesn't kill Spider-Man, thinking it an unworthy end, but doesn't help him either. Shocker found another moment of victory over Spider-Man when he teamed up with the Trapster. Sent by the Friends of Humanity to assassinate Paul Stacy, the duo managed to glue Stacy and Spider-Man together and corner them, only to be called off their assignment moments before finishing them off. Shocker would later turn on the Trapster at the behest of Osborn of having Trapster eliminated as a potential witness against his recent attempt to frame Spider-Man for murder. Preparing to kill the resigned Trapster in an alley, he was attacked and rendered unconscious at the last minute by Spider-Man (then disguised under the alias Dusk). He allied himself with Speed Demon of the New Thunderbolts in order to break into a particularly well-guarded safe. Though the police arrived at his hide-out in quick pursuit, he was saved by Speed Demon dashing in and stole both the loot and Shocker's weapons, removing all traces of evidence (and, unfortunately for Shocker, also keeping the money to fund the Thunderbolts' further activities). A new version of the Sinister Six, with Shocker as a member, bands together during the Civil War but were stopped by Captain America and his Secret Avengers. In his first Brand New Day appearance, he is shown to have been hired by a mobster to take out a subway train wagon full of jurors. After a brief battle with Spider-Man, he is knocked unconscious while Spider-Man uses his gauntlets to destroy rubble blocking the path. Although he seems cooperative at first, as soon as he is secured by Spider-Man, he activates a powerful shock in his gauntlets through his belt, causing the main exit to collapse and allowing him to escape. On their way to collect money from bets on superhero fights, Shocker and Boomerang discover the dead body of "the Bookie". During the Origin of the Species storyline, Shocker is invited by Doctor Octopus to rejoin the reestablished Sinister Six, where he exchange for securing some specific items. He and Tombstone went after Menace's infant in the restaurant shop, until Spider-Man interfered. After he passes out from his fight, the police arrive but Shocker is carried away by Tombstone, who escapes. When Spider-Man goes on a rampage against the villains after the infant was stolen by Chameleon, Shocker is attacked in his hideout and threatens Shocker to tell him everything about the villains' whereabouts. Shocker tells Spider-Man that Chameleon has the baby at the Kravinoff Mansion. During the Spider-Island storyline, Spider-Man and Carlie Cooper encounter a six-armed Shocker. During the fight, Shocker reveals that he wants the money so that Mad Thinker can cure him. Shocker then pulls off his mask to reveal that he's slowly mutating into a spider-like creature. Shocker later appeared as a member of Villains for Hire (a villain counterpart of Heroes for Hire). As part of the Marvel NOW! event, Shocker appears as a member of the latest incarnation of the Sinister Six, consisting of himself, Boomerang, Lady Beetle, Speed Demon, Overdrive, and the Living Brain. Shocker features as one of the main characters in The Superior Foes of Spider-Man, which concludes with Silvermane crowning him the new don of the New York underworld after Shocker saves dozens of mobsters by singlehandedly defeating the Punisher. Shocker shares a meal with She-Hulk when they discuss about a memory Jennifer can't remember, so Herman helps her by telling what little he remembers because she treated him well and bought him lunch while other heroes would just beat him up and ask questions later, it was then revealed that a villain named Nighteater created a spell that would murder hundreds of people but made everyone forget he was a villain but a hero named Nightwatch instead because it was more profitable, when Shocker found out he assisted She-Hulk in defeating Nightwatch, when asked by Nightwatch why Shocker was mad after already getting his cut even if he did forgot, Shocker said that it was because he wanted to be a hero too. When New York City was covered in the darkforce dome by the evil Captain America, the Shocker and Scorpia took advantage of this by robbing a bank but was stopped by Rogue. When the Shocker accidentally crushes the ground beneath them, they were surrounded by darkforce creatures and had no choice but to work together. When they finally beat the biggest of the creatures, Rogue flies away. Herman Schultz is being trialed for his crimes as the Shocker and Rogue volunteers herself as a character witness and said that the Shocker from her experience, when she was fighting darkforce monsters alongside him, was smart, kind and courageous, and given the chance could redeem himself. The Shocker wears a pair of gauntlets he designed with vibro-shock units known as "vibro-smashers" that, when activated by a pump-action thumb trigger, can project a concentrated blast of compressed air that vibrates at an intense frequency. This creates a series of rapid-succession high-pressure air blasts that result in a series of powerful impacts. This allows Shocker to both effectively throw long range vibrational punches from a distance, creating destructive vibrations that can crumble solid concrete and cause extensive damage to the human body and its internal organs, as well as throw shock waves which vibrate the structure of something in order to weaken or destroy it. A lesser known ability of the gaunlets allows Shocker to make incredible leaps, by directing the air blasts toward the ground in front of him. Holding the thumb triggers down for an extended period of time increases the intensity, speed, and even spread of the air blasts. The feedback from the Shocker's gauntlets is extremely intense (the initial test almost killed him). To guard himself from this, he developed a protective costume consisting largely of yellow quilt patches designed to absorb the shock. The costume is made of foam-lined synthetic fabric which absorbs all vibrations and establishes a vibrational shield which deflects normal blows and allows him to slip from any grasp. The costume's appearance has been the source of ridicule on the part of Spider-Man and other characters. How fellow villain the Looter was able to once wield one of the gauntlets without wearing a protective costume and suffering injury is unclear, though his super strength and durability were presumably a factor. Despite having no superhuman abilities, his vibrating suit and gauntlets enable him to trade blows with Spider-Man. Around the year 2000 (real time), Herman Schultz began upgrading the abilities of his costume and weapons. His suit now contains a number of built-in shock units, which throw up a protective vibrational field when triggered by accompanying motion detectors. Besides deflecting most physical blows, this makes it difficult, if not impossible for someone to physically assault or grasp him by surprise. This power upgrade was accompanied by a much bulkier and more protective looking costume (as designed by artist John Romita, Jr.). He also recently allowed Hammer Industries to drastically upgrade the power of his gauntlets. However, not trusting to share the whole of his secrets (and thus become what he perceives as expendable), he refused Hammer's technicians access to his actual costume, which (at least at the time) likely wasn't providing him with thorough protection from the feedback of the upgraded gauntlets (he cited nosebleeds as a risk he was willing to take). While the Shocker has not actually appeared in the MC2 universe, his gauntlets have been seen in the use of the bounty hunter Mad Dog Rassitano. In JLA/Avengers, the Shocker is among the mind-controlled villains who attack the heroes as they assault Krona's stronghold. He is defeated by the Flash. The Ultimate Marvel incarnation of Shocker is 33-year-old petty crook Herman Schultz who raids money transports. He wears a purple trench coat and a pair of goggles to protect his eyes. He used to work at Roxxon Industries and invented his weapons there. He was fired later and then became the Shocker to "get what he deserves" for all the work he has done. He is not especially dangerous and has fought Spider-Man five times in the first 100 issues. During several, there was an unusual factor: Spider-Man wearing the black suit, or the presence of Kitty Pryde, or Wolverine putting Shocker at a disadvantage. Ultimately, he suffers five embarrassing defeats. Thus, he perpetually ends up in jail and his equipment is confiscated. However, he somehow manages to get a new set every time he escapes. It was shown in Ultimate Marvel Team-Up that he does make new vibration units in the machine shop of the prison. It is also implied that he isn't always charged with anything; Spider-Man simply leaves him at the crime scene. This was noted in their encounter in the second annual when Foggy Nelson advised Spider-Man to hand him over to the police rather than leave him on the ground. [volume & issue needed] He is seen in the annual being dropped off at a police station while crying. [volume & issue needed] He gets some measure of revenge, where he unexpectedly defeats, captures, and tortures Spider-Man, and relays his background. He studied at MIT vigorously and eventually secured a job at Roxxon Industries creating high-end weaponry before being cheated out of his work and earnings. With Spider-Man as his only outlet for rage, he proceeds to assault him brutally before once again being arrested by the authorities led by NYPD's Captain Frank Quaid under a tip from Kitty and Mary Jane Watson. During the "Secret Wars" storyline in the pages of Amazing Spider-Man: Renew Your Vows, Shocker appears as an enforcer of Regent where he is seen assisting Boomerang and Rhino in beating up Demolition Man. He later appears as a member of the Sinister Six when they are tasked to hunt down Spider-Man. During the "Spider-Geddon" storyline, an unnamed Earth featured a female version of Shocker. Her identity is Anita Dillon. When Shocker harms Betty Brant, she is saved by the Spider who defeats Shocker. Shocker on Spider-Man and His Amazing Friends. Shocker appeared in Spider-Man and His Amazing Friends, voiced by John Stephenson. He was seen in the episode "Along Came A Spidey". Shocker appeared in the 1990s Spider-Man animated series, voiced by Jim Cummings. This version fires electric bolts from his gauntlets rather than compressed air, and also hinted that Herman Schultz was a high level thug and friend of Alistair Smythe before he wore his trademark suit. Shocker is a villain usually hired by the Kingpin. In his first appearance during "The Alien Costume" multi-part saga, he was hired to eliminate Eddie Brock due to the Kingpin being worried of a compromise of the Prometheus X's recent theft. Shocker was recommended to the Kingpin by Smythe (Shocker's suit's designer). But due to Spider-Man's arrival, Brock escaped Shocker's wrath. Spider-Man followed Shocker back to his hideout, stealing back the Prometheum X (which was stolen by the Rhino in the previous episode). Hired again for a retrieval, Shocker kidnapped John Jameson and demanded that J. Jonah Jameson bring both Spider-Man and the Prometheum X. Meeting in a church tower, Shocker handed John over safely. But after the Jamesons left, a battle ensued between Shocker and Spider-Man. Despite Shocker's initial confidence, Spider-Man gained the upper hand, destroying his weapons and nearly killed him (due to the alien symbiote's influence) before coming to rational thinking and saving him from a lethal fall. Later, Shocker and the Rhino teamup against Spider-Man (it's never stated onscreen if they were ordered to do so by the Kingpin or if they're acting on their own). The pair nearly succeeded against Spider-Man, but before they could finish the web slinger, Venom attacks and defeats the two, wanting to kill Spider-Man personally. After Shocker and the Rhino somehow go to jail, Shocker is part of a prison break arranged by the Kingpin in "The Insidious Six" two-parter. He joins the Insidious Six along with of Doctor Octopus, the Chameleon, Mysterio, Rhino and the Scorpion to kill Spider-Man but ultimately fail to kill their mutual nemesis. When Spider-Man tricks the unintelligent Rhino into attacking Shocker by claiming to be the Chameleon, the Rhino's horn rips Shocker's electroshock suit. Spider-Man throws Shocker into a water-tank, causing his suit to become unstable and forcing him to take it off and get out before exploding. Following a major defeat, the entire team rejects the Kingpin and disbands. Yet in the episode "The Awakening", Shocker was hired yet again by the Kingpin to work with Dr. Herbert Landon to kidnap Michael Morbius. They succeeded but Morbius escaped in the end with help from Spider-Man and the Black Cat. Shocker's last appearance was being a member of the Insidious Six in the "Six Forgotten Warriors" saga (yet he has only one line of spoken dialogue despite appearing in every part of the storyline). Throughout the series, Shocker's real face is never shown as demonstrated from such examples of wearing his mask while his suit is damaged and even while in prison. The Shocker alias is used in The Spectacular Spider-Man animated series by Jackson "Montana" Brice (voiced by Jeff Bennett) instead of Herman Schultz; a creative choice made by series producer Greg Weisman during production of this series. Shocker appears in the Ultimate Spider-Man animated series, voiced by Troy Baker. In the episode "Burrito Run", Spider-Man, Power Man and Squirrel Girl find him trying to break into a building and engage him in battle. While Power Man and Squirrel Girl provide the distraction, Spider-Man uses taser webs on him. When Shocker regains consciousness, he doesn't know how he got there since he last remembers being in his apartment. As the three young heroes leave to complete a burrito run, Shocker begins to free himself. It turned out that Mesmero has taken control of Shocker's mind as he is accompanied by Boomerang and Grizzly. Mesmero gets forced by Spider-Man to free the villains from the mind-control. Spider-Man then left Boomerang, Mesmero and Shocker webbed up for the police. In the episode "Halloween Night on the Museum", Shocker is chasing after Spider-Man until the web-slinger defeats him. In the episode "Nightmare on Christmas", Shocker is seen robbing a bank on Christmas Eve until he fights Spider-Man, and is defeated and left for the police again. Shocker has a cameo appearance in "Contest of Champions" [Part 1] among the Grandmaster's villain collection against Spider-Man and the Collector. In the episode "Anti-Venom", Shocker is seen being defeated by Spider-Man and Agent Venom as Shocker was among the HYDRA-backed Sinister Six's candidates. Herman Schultz appears in the 2017 Spider-Man animated series, voiced by Cameron Boyce. This version is an overweight teenager who specializes in vibration technology. First appearing in the episode "Osborn Academy", Herman competes with Clayton Cole for a position at Osborn Academy with their sound-based technology until Spider-Man intervenes. The three-way battle was crashed by Jackal who steals Herman and Clayton's technology with the help stolen Stark Industries tech. The two of them help Spider-Man by telling how to disable the tech. After Jackal gets away, Spider-Man brings Herman and Clayton back to Osborn Academy to face their actions as Spider-Man tells Osborn Academy's security team to grant them leniency. Norman Osborn takes the blame for driving the two boys into what had transpired. Osborn grants Herman a spot in Osborn Academy while telling Clayton to try again next time much to Max Modell's objection. As part of the viral online marketing for Marc Webb's The Amazing Spider-Man 2, articles by The Daily Bugle were released online. One of these articles included a story about the capturing of Herman Schultz / Shocker prior to the events of the film itself. Herman Schultz / Shocker appears in Spider-Man: Homecoming, played by Bokeem Woodbine. This version of the character is depicted as an employee of Adrian Toomes's salvaging company along with Jackson Brice, Phineas Mason and Randy Vale. When the salvaging company went out of business because of Damage Control, the group decided to turn to crime. Schultz wields a modified version of Crossbones's gauntlet that emits vibro-blasts, that is previously wielded by Brice. Schultz and Brice attempt to sell Chitauri technology to Aaron Davis, which gets interrupted by Spider-Man. Following Toomes accidentally killing Brice with a disintegration weapon for jeopardizing the mission, Schultz gets the Shocker gauntlet and mantle and tracks the tracer in a weapon recovered by Peter Parker to Midtown High where Parker and Ned barely evade him. Later, Schultz manages to escape from the Staten Island Ferry ambush by the FBI and Spider-Man. Schultz subsequently attacks Spider-Man at Midtown High when leaving the homecoming dance to pursue Toomes. Schultz commented that Toomes gave a choice and Spider-Man chose the wrong one. Spider-Man defeats him with Ned's help and leaves him webbed up. Android replicas of Shocker appear repeatedly in Spider-Man/X-Men: Arcade's Revenge as mini-bosses during Spider-Man levels. Shocker appears as a mini-boss in the Spider-Man Animated Series video game for the Sega Genesis and SNES. Shocker appears as the first boss in Spider-Man 2: Enter Electro, voiced by Daran Norris. In this game, Shocker is hired by Electro to steal a piece of the Bio-Nexus Device. Spider-Man eventually uses his spider tracer to track down Shocker at a warehouse. When Shocker arrives at a warehouse, he gives the brief case that has the piece of the Bio-Nexus Device to Hammerhead to prevent Spider-Man from getting it. Shocker is later defeated by Spider-Man and is left for the police. Shocker appears in the Spider-Man video game, voiced by Michael Beattie. He is initially allied with the Vulture when the two rob a jewelry store, but betrays the location of Vulture's headquarters after he is defeated by Spider-Man in a fight; he refuses to allow Vulture his share of the loot when the Shocker can't have it. He and his thugs fight Spider-Man at Grand Central Station, with Spider-Man subsequently pursuing and defeating Shocker in the underground tunnels. Michael Beattie reprises his role of Shocker in the Spider-Man 2 video game. He escapes prison while participating in a contest arranged by Quentin Beck trying to prove Spider-Man's powers are fake. Despite having gained access to an experimental space propulsion system that enhances his powers, he is defeated by Spider-Man and Black Cat. Ultimate Shocker appears in the Ultimate Spider-Man video game, voiced by Brian George. He occasionally pops up attempting to rob banks. Shocker is a mini-boss in Marvel: Ultimate Alliance, voiced by Michael Gough. He is a member of Doctor Doom's Masters of Evil. He works alongside Rhino in fighting the heroes: The first time was in Murderworld and then guarding Heimdall. Shocker has special dialogue with the Human Torch. A simulation disk has the heroes fighting Shocker on the S.H.I.E.L.D. Helicarrier. Shocker appears in the PSP and PS2 versions of Spider-Man: Web of Shadows, voiced by Liam O'Brien. An earlier mission involved Spider-Man having to obtain Shocker's gauntlets as part of the components for a sonic emitter that can stop the symbiotes. He also appears as an assist character who will use the intense vibrations shot from his gauntlets to attack. Shocker appears as a mini-boss in the Xbox 360 and PS3 versions of Marvel: Ultimate Alliance 2, voiced by Rick D. Wasserman. The players encounter him holding Ms. Marvel prisoner in the tunnels to Roosevelt Island. Shocker appears exclusively in the Nintendo DS version of Spider-Man: Edge of Time, voiced by Steven Blum. He fights the Spider-Man of the 2099 era that's stranded in the 616 New York's sewers. Spider-Man mentions learning about Shocker from a second-rate villains class. Shocker appears in Marvel Heroes, voiced by David Boat. Shocker appears as a playable character in Lego Marvel Super Heroes, voiced by Greg Cipes. In a bonus mission, Shocker and Electro collaborate to rob a bank in the Financial District. Both of them are defeated by Captain America, Iron Man and Spider-Man. Shocker is a boss villain in Marvel: Avengers Alliance and was later released as a playable character. Herman Schultz appears in The Amazing Spider-Man 2 video game, voiced by Ryan Alosio. He initially appears as a gang boss before becoming Shocker using stolen Oscorp construction equipment called the Seismic Harness Construction Resource in the hopes of 'upgrading' himself to cope with the superhumans emerging. Spider-Man defeats the Shocker who reveals that the gangs (examples being the Russian Mobsters, Hammerhead's crew, and Mister Negative's men) are all in fear of the Carnage Killer and are at war. Spider-Man leaves Shultz to be arrested by the police and leaves. Shocker appears as a mini-boss in Marvel: Avengers Alliance 2. Shocker appears as a playable character in Lego Marvel Super Heroes 2. Shocker appears in the 2018 Spider-Man video game, voiced by Dave B. Mitchell. This version of the character takes on a more modern look than in the comics, most notibly being his metallic, high tech, robotic-looking mask, and the fact that, beside firing compressed air, he can use his sonic gauntlets to also jump at very further distances. 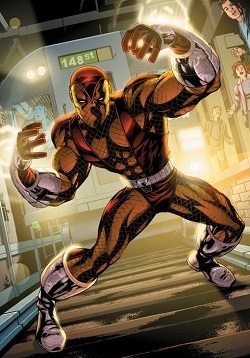 He also appears to be an old enemy of Spider-Man, having already fought him several times in the past, and, some time prior to the events of the game, was defeated by Spider-Man and subsequently imprisoned in either Ryker's Island or the Raft. Shocker first appears committing a small robbery after having been recently released from prison. While being chased by Spider-Man, Shocker accidentally gives away that he is committing crimes at the behest of someone whom he is afraid of, as they threaten to kill him if he doesn't do what they ask him to. Spider-Man eventually catches up with Shocker and defeats him, leaving him for the police to take him back into custody. However, Shocker is broken out of jail once again some time later, by the same person forcing him to commit crimes, later revealed to be Mister Negative's gang, the Inner Demons. While robbing a bank, Shocker is confronted again by Spider-Man and, having nowhere to run this time, fights him. After a very destructive battle, Spider-Man eventually defeats Shocker by overloading his gauntlets and trapping him under some debris, and once again leaves him for the police to take him back into custody, this time for good. ^ Vault of Spiders #2. Marvel Comics. ^ a b c d e f g h i j k l m n "The Voices of Shocker". Behind The Voice Actors. ^ "Search Ask Greg : Gargoyles : Station Eight". April 1, 2009. ^ "Burrito Run". Ultimate Spider-Man. Season 3. Episode 17. July 28, 2015. Disney XD. ^ "Descendants Cameron Boyce to Tangle With Marvel's Spider-Man – First Look". TV Line. August 18, 2017. Retrieved August 26, 2017. ^ Sciretta, Peter (April 3, 2017). "'Spider-Man: Homecoming' Set Visit: Everything We Learned". /Film. Archived from the original on April 4, 2017. Retrieved April 4, 2017. ^ Dornbush, Jonathon (April 4, 2018). "Marvel's Spider-Man Gameplay, Story Details Revealed". IGN. Retrieved April 7, 2018. This page was last edited on 31 March 2019, at 12:13 (UTC).